For God so loved the world, that he gave his only begotten Son, that whosoever believes in Him should not perish, but have everlasting life - the Bible - John 3.16. 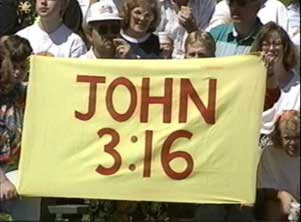 Have you ever seen the words John 3 v16 held up at a sporting event (see pictures)? Did you ever wonder what it meant? Have you ever longed to be loved unconditionally, sincerely and consistently? Well listen to this. For God - the greatest being in the universe loves you. So loved - His love is the greatest show the greatest degree of love - He gave His Son, Jesus, to die for our sins. 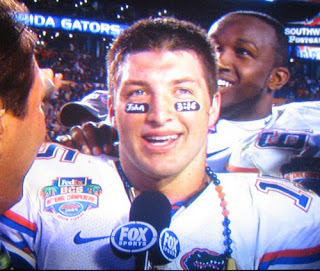 His love is to the widest audience ever - the world. that He gave - this was the greatest act of love - when you consider that we were His enemies, disobedient to him and sinners. His only begotten Son - this is the greatest gift possible. Consider the value and status of the Son of the living God. The creator, the supreme one given to the death of the cross to pay the price for sin. That whosoever - the widest audience possible - no one is excluded. God is not willing that any should perish. Believes in Him - the greatest simplicity, believe and receive. Should not perish - the greatest guaranteed promise. No doubt, no maybe's salvation is secure. But - the great differentiator, we all stand on one side or the other. Saved or lost, dead in sin or life in Christ. Everlasting life - the greatest possession. Nothing else comes near, everything else has an expiry date. Read this verse until you understand all that God wants to bless you with.